Author Keith HumphreysPosted on May 11, 2014 May 8, 2014 Categories Culture & Civil SocietyTags Kevin Durant, Literature, Mother's Day1 Comment on Happy Mother’s Day! It’s hard to say anything specific about NeverwhereÂ without spoiling Gaiman’s very careful exposition, so I’m going to put the substance of what I have to say about it after the jump, and urge people who haven’t read the book, but might, to do so before reading past the jump here. It’s a fantasy with a realistic framework, set in the London of the mid-1990s or perhaps slightly earlier. * The Marquis de Carabas is the title Puss-in-Boots invents for the miller’s son he wants to pass off as an aristocrat. * The London Underground station in Islington is Angel. in the double mirror of a barbershop. He was in that kind of mood. my mom was nodheaded beside me, lightly snoring. while Dad tells me about our civilization. with numbers waiting on their sleeves. “I do not choose to count as a part of my life the three years I spent selling shoes”. James Branch Cabell seems to have borrowed his fantasy theogony from Hume’s Dialogues on Natural Religion. A man, who follows your [theistic] hypothesis, is able, perhaps, to assert, or conjecture, that the universe, sometime, arose from something like design: but beyond that position he cannot ascertain one single circumstance, and is left afterwards to fix every point of his theology, by the utmost licence of fancy and hypothesis. This world, for aught he knows, is very faulty and imperfect, compared to a superior standard; and was only the first rude essay of some infant deity, who afterwards abandoned it, ashamed of his lame performance: it is the work only of some dependent, inferior deity; and is the object of derision to his superiors: it is the production of old age and dotage in some superannuated deity; and ever since his death, has run on at adventures, from the first impulse and active force, which it received from him. Surely this must be the origin, directly or indirectly, of the theogony James Branch Cabell invents for the Biography of the Life of Manuel, in which the God of Abraham appears as a created being, and thus at one remove of Heinlein’s in Job. Footnote Can anyone tell me why the Library of America, which has published (e.g.) two volumes of short stories by William Maxwell and two more by William Dean Howells, has yet to publish a syllable of Cabell’s work, most of which is out of print? Aragorn: What do you fear, lady? Ã‰owyn: A cage. To stay behind bars, until use and old age accept them, and all chance of doing great deeds is gone beyond recall or desire. –From The Return of the King by J.R.R. Tolkien. 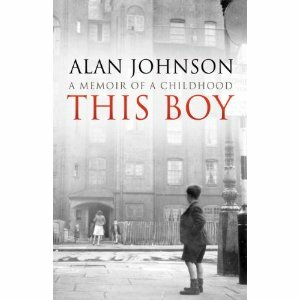 Former UK Home Secretary Alan Johnson’s memoir This Boy is one of the best non-political books ever written by a politician. It’s a beautifully written, uncompromising, touching and also at times funny account of a childhood lived out in grinding poverty in post-war Britain. More than anything, the book is a heartfelt tribute to the amazing mother and older sister who gave Johnson the love and support he needed to survive when his father abandoned their family. 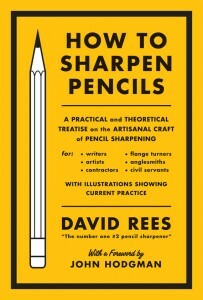 To my mind, the greatest shortcoming of the electric pencil sharpener is not its limited utility, but the way it alienates its user from the pencil-sharpening process. In a culture that prizes openness and accountability, this device remains a defiantly closed system; the ultimate black box; a windowless abbatoir. The unreliable narrator can be an effective literary device, whether the unreliability stems from a weakness for rationalization (Humbert Humbert) or temporary impairment (Venya on his way to Petushki). But for comic writing, few things work as well as the oblivious narrator, the one who takes him or herself and surrounding situation completely seriously when any other person (e.g., the reader) would double over in laughter. 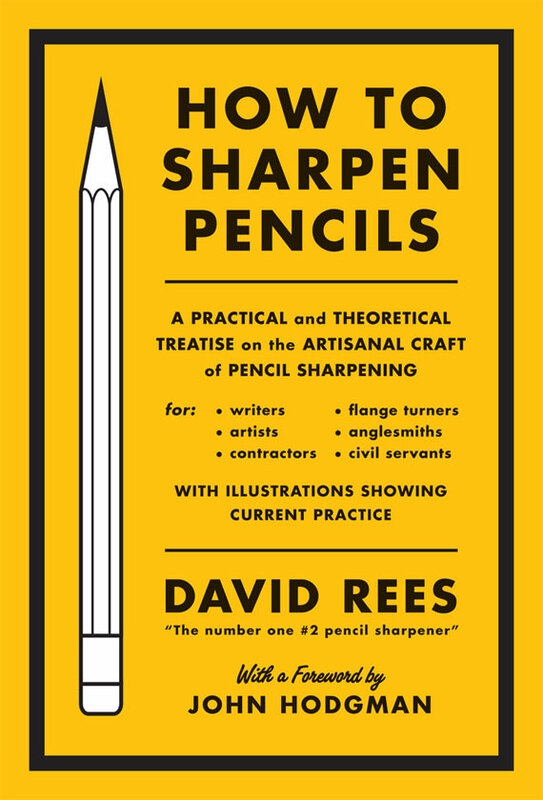 A friend who accompanied me to what I judged the second most-boring museum in the world (The Pencil Museum in the Lake District) recently did me the kindness of mailing me one such book: David Rees’ dead-on, dead-pan guide to the artisanal craft of pencil sharpening. The quote above is an example of the portentous tone of the book, in which an emotionally stunted weirdo who has devoted way, way, way too much time and thought to pencil sharpening dispenses wisdom regarding his craft. I think I pulled a gut muscle reading it and if you like this sort of humor, you’d do well to check it out. 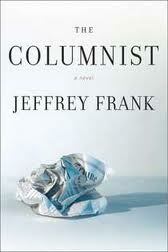 Another book that is just as funny in the same way is my favorite Washington D.C. satire: The Columnist by Jeffrey Frank. The narrator is political journalist Brandon Sladder, a self-involved, self-serious jackass who addresses the reader with the evident intention to impress. He invites us into what he considers the high-minded, well-informed Washington insider life that he thinks he leads, but the result is that pretty much everyone but him recognizes that he is an empty-headed, shallow hanger-on. It’s wickedly delightful and if you know our nation’s capital, painfully familiar at the same time. As with Rees’ book, if you like this style of comic writing, you will be richly entertained by The Columnist. What are you own favorite closing and opening sentences?